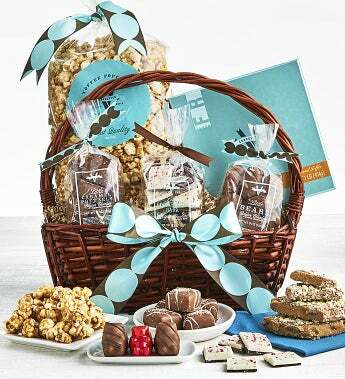 This wonderful gift basket is brimming with premium chocolate treats that are perfect for every gift-giving occasion. Packed with tremendous care, these gorgeous hand-woven baskets are lovingly tied with a beautiful ribbon. V Chocolate artisans' very best almond toffee, peppermint bark, chocolate covered cinnamon bears, caramel pretzels, and toffee popcorn complete this gift. Kosher OU D.
The artisans at V Chocolates have been creating the finest toffee and chocolates since 2007. Unwavering quality of ingredients and old world confectionary traditions are their secrets to success. Their awarding winning confections are made with premium Belgian chocolate and have been twice featured on Oprah's Favorite Things List. V Chocolates strives to create a total sensory experience with every delicious bite. Gift measures 14" x 12" x 7"